When varicose veins are diagnosed in the early phase, various non-scarring treatment options exist such as vein sclerotherapy (injection) and laser, etc. without resorting to surgery. 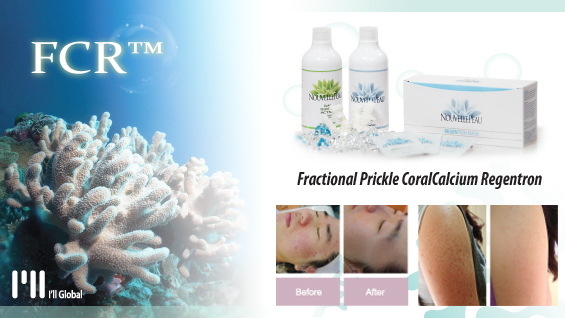 These methods do not cause bleeding, pain or scarring. Most patients are not familiar with varicose veins and as the condition is not painful they do not inspect their legs carefully. Left untreated over a long period of time, venous valve insufficiency worsens and simple procedures are not enough to prevent recurrence. varicose veins tends to be hereditary and if family history of varicose veins exists, it is advisable to sign up for an early screening. Varicose veins usually develop past 20 years of age. Easily recognizable early presentations are tortuous protruding blue veins in the leg. If these symptoms exist, varicose veins can be suspected. Early treatment is important in any disease as treatment is easier and involves less sequelae. Being knowledgeable about early symptoms will help patients visit a doctor for early screening. If at least four of the following symptoms are present, I advise getting an extensive screening of varicose veins at a specialized hospital. 1) heaviness in the legs. 2) fatigue from short period of walking. 7) abnormal protrusion of leg veins. 9) more visible veins in the leg. 10) frequent back and knee pain. Among many classification methods of varicose veins, CEAP classification is globally referenced. However, I believe it is too complicated and impractical to be used in clinical practice. 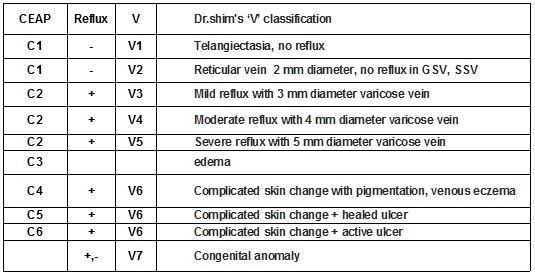 <Table 1> shows Duffy Classification that divides varicose veins based on the vessel thickness and is easy to use. Spider veins are a type of talengiectasia that can occur in any area of the lower limb. However, the facial spider veins differ from those in the lower limb. Facial spider veins have central arteriole but lower limb spider veins do not. See <Table 1> for details on Duffy classification. Table 1. Vessel Classification by Duffy. As shown in <Table 2> the drastically lower prevalence of Type I in Korea may be due to lack of interest in lower limb talengiectasia among Korean patients or, lower incidence of talengiectasia associated with skin characteristics different from Caucasians. Type 1 and 2 accompanying talengiectasia are more common in Caucasian patients in the out-patient setting, whereas Type 3 without talengiectasia make up the majority in Korean patients. Table 2. Dr. Shim's Case Classification Based on the Vessel Classification by Duffy. <Table 2> presents statistics from my clinical experience. Recently, recognition of varicose veins has increased and more patients are seeking aesthetic treatment of talengiectasia. * C2sEpAs4Pr: C2s-clinical symptoms present varicose veins with symptoms (class 2). Ep- the cause is primary varicose veins. As4- the site of varicose veins is superficial veins. The varicose veins are in GSV inferior to the knee. Pr- The cause is regurgitation due to valve insufficiency. In this classification, it is difficult to use in clinical practice as it is more complicated and inconvenient. 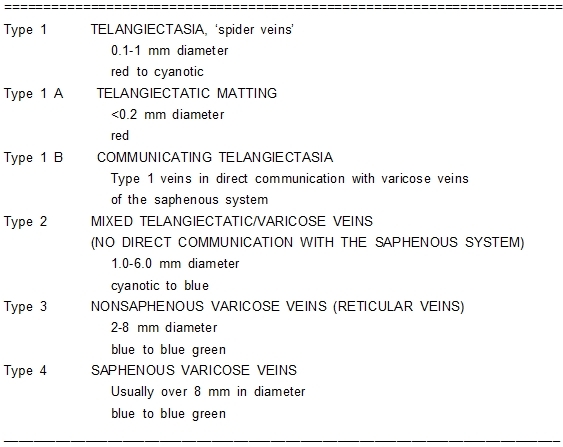 Based on my clinical experience with a large number of patients over 40,000 cases of operation, I have devised the below classification system based on the vein thickness and existence of regurgitation for the purpose of communicating the mild case of varicose veins with patients and creating a more clinically relevant classification system. I have used this system from the 1995 in Korean and Chinese patients, and have found it is helpful. Table 3. Classification by Young-ki Shim. The biggest difference from CEAP classification is that C1 is divided into V1 and V2. C2 is divided into V3, V4, and V5 according to the diameter of protruding vein in outside. Ulcer, skin discoloration and other rare complications are categorized into V6 integrating C4, C5, and C6. This division allows identification of the severity with V levels and provides useful standard for treatment guideline. I believe future discussions and studies will have to evaluate the validity of my classification to establish as a standard method. I write ‘V3 rgsv’ for stage 3 varicose veins originating from right GSV with protruding vein and its diameter is about 3 mm.